I can’t seem to decide what to do with my hair lately. I complained to Amara the other day that I really needed to have her Mom cut my bangs at least. Amara eagerly offered to cut them for me. 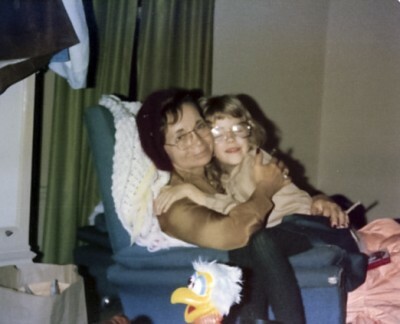 After one huge shudder that came with memories of my mother, I wisely declined and told her the story of the time her Mommy had cut her grandma’s hair. If you’ve read some of my posts about my own childhood, you have probably figured out by now that my real mother was an extremely difficult woman. That is just such an understatement. You never knew what kind of mood she would be in but you tread lightly as her mood changed with the snap of your fingers. You never knew what would set her off. When Jenna was in 4th grade, she would often walk from her elementary school to her grandma’s until either her Dad or I got off work and picked her up. The school wasn’t even a half block from my mom’s place and she would usually walk up to the school and wait for Jenna to get out. Mom lived in an apartment complex with a HUGE swimming pool and that was where they often spent their time. 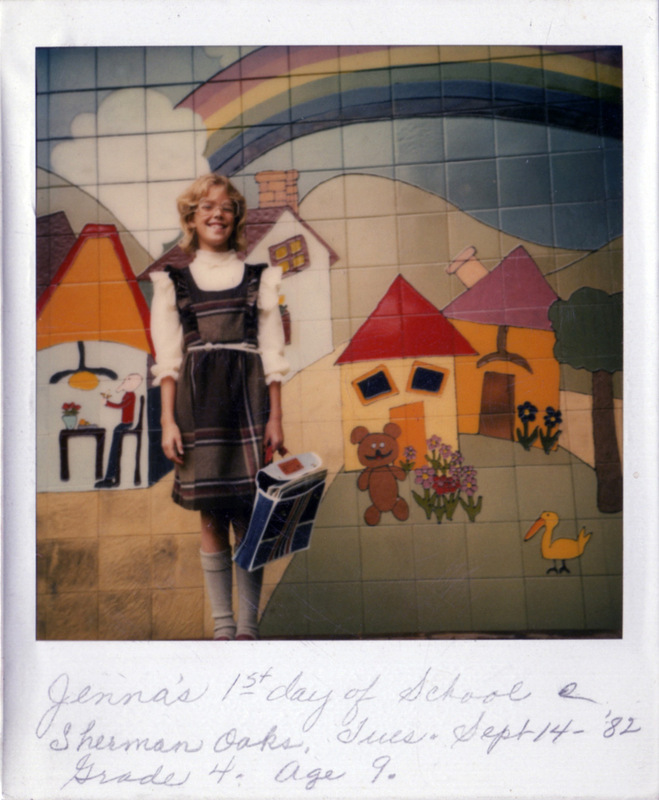 Jenna has better memories of my mother than I do and my mother really loved Jenna dearly but even that didn’t shelter her from my mother’s occasional wrath. This story was about the time I arrived to pick Jenna up only to find my mother in the foulest mood ever. She proceeded to scream at me, “Look what Jenna did to my hair!” Mom had seen a new hairstyle and Jenna offered to cut it for her. My mother let her! I seldom stood up to my mother but even I lost my temper. I was mad that she had Jenna in tears because she had no common sense. I vividly remember screaming at her, “What were you thinking letting a 9 year old cut your hair?” My screaming didn’t help much, she just couldn’t understand how Jenna had done that to her. I personally thought she got the haircut she deserved! Is it funny or sad that I also have a very vivid memory of my mother getting furious with me for botching her haircut? I was 10 at the time, she had seen a haircut at Church that she really liked, and I offered to cut it for her. Like Jenna, my intentions were good; we both thought we could do it! We both lived to regret trying. Therefore, when Amara offered to cut my hair I just shuddered and shared this story with her. The bad hair cutting by children stop here! This memory was posted in Grandparents and tagged Amara, Grandma, haircuts, Jenna on April 7, 2015 by Grandma Kc. Yikes. I suppose most of us make momentary poor judgement calls while bringing up our kids, but these are over the top. Save the scissors for Barbie’s hair, grandma! And then to get mad at the kid?! Yikes, again! But I loved seeing your pictures. There is so much of Amara in both you and Jenna – lucky little girl! No wonder she’s so sweet and pretty! I love looking back and seeing the closeness between Jenna and my mom, too. It was something she and I just didn’t have. Makes me extra glad that Jenna and I are close. The cycle has been broken–in more than one way, I imagine. It really isn’t a joke that I survived — and thrived in spite of my mother. Oh my goodness Kc… as an adult I never even cut my own children’s haìr… not even a trim… I loved them too much to subject them to that… I told them both their hair deserved a professional. Don’t you hate it when you don’t listen to your own inner voice that says don’t do it?! At least you and I both learned some good lessons on how not to treat our daughters! Me, too! Not acceptable behavior! I had some of those perms! Thank goodness perms are a thing of the past. I wonder if Amara would even know what one was! Ha! After watching Noli give her ponies haircuts, I wouldn’t let that child within 10 feet of my hair! Great (and funny) story, even though not so much at the time! Oh Amara is very good at styling pony hair — which for those of you who don’t have granddaughter this age refers to My Little Ponies which both Amara and Noli love! Oh, my goodness, what an awful ordeal. I love what Kristi said- the cycle being broken…in more than one way. An ordeal — yep, that describes life with my mother. Oh wow. What a hair raising story! LOL I cannot imagine letting just anyone cut my hair, let alone a child! I’m so glad the tradition has ended! Good for you! I have always been very particular about who I let touch my hair — especially when it was really long. I can remember more than once getting very angry because their one inch trim left my hair 4 inches shorter! No common sense on that one is right. If you are going to let a child cut your hair, you shouldn’t get mad at the results! And I know you wouldn’t have had the same reaction after Amara cut your hair, but good idea to leave it to a professional. I learned that also after I butchered myself as a young teen and even my son’s bangs when he was two! Love the pictures!! I do often cut my own bangs but that is where we draw the line! Now that Jenna is older and amazing at most everything she also does my color. I do think I was wise to just not run the risk of Amara butchering it! And you’re right, if she had I certainly would have dealt with it a lot differently! Once I walked up behind my mom when I was little and asked, “Can I cut your hair?” She said yes, thinking I was just going to pretend-cut it with my fingers. Nope. I chopped a big chunk of her hair off! Oh my! She can not have been amused! It seems to me that your mom thought you were born her senior and able to handle all manner of things. I’m not sure I could have gotten angry over laughing at the absurdity of nine year old being able to do that. Wow- some serious craziness now. That really is the blessing of natural curls- hides a multitude of bad haircuts. You put it very well. I had more on my shoulders than any child should have and it wasn’t always easy. Which I guess is a big part of why I so love my life now. I have a wonderful husband, daughter and SIL, an amazing grandchild, a sister and a BIL and new Mom that I love. Growing up I never imagined that life could turn out so good! You just have to laugh about it. The truth is she never had good judgement about anything! Ever! It’s incredible the resemblance between Jenna as a youngster and Amara! Such lovely girls! She is definitely here Mommy’s daughter! It isn’t just that they look a lot alike in the face but their bodies and the way they move and everything! Amara was here playing with the super soakers on Monday and I just couldn’t get over how much her arms and legs and torso — everything looks just like her Mom’s did at this age! Oh goodness, how I can relate. We had a teen foster daughter years ago who was in the very early days of cosmetology. She offered to cut my hair and I wanted to show my belief in her. Needless to say, we still laugh about it to this day. She has children of her own now and she says that there is no chance that any of them will touch her hair with scissors. You certainly had wonderful intentions in trying to support her. I went to cosmetology school for a while and I saw some of those haircuts — oh my! At least it will always grow out! Funny picturing you yelling at your mother…..you always seems so calm and easy flowing! I botched cutting my kids hair….my son whines about his ‘bowl’ cuts to this day and my daughter cracks up that they both looked alike when I was done! But, wise grma that I am, I hold my tongue when she snips her own kids’ hair. Loved this peek into your past, Kc. And the pics of Amara jogging…..wow, she’s growing so fast! Great fun catching up on your posts! Have a fabulous weekend, KC!